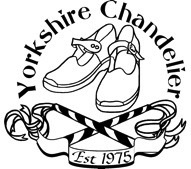 Yorkshire Chandelier is a women’s clog dancing team from South Yorkshire, founded in 1975. We take our name from a traditional corn dolly we carry with us and can be recognised by our brown mill clogs and green and yellow kit. 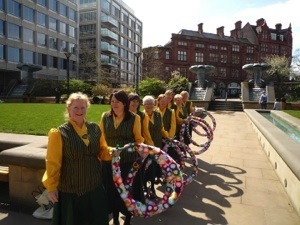 We perform a variety of dances , mostly from the North West of England, many of them named after the village from which they originate such as Runcorn or Handforth. 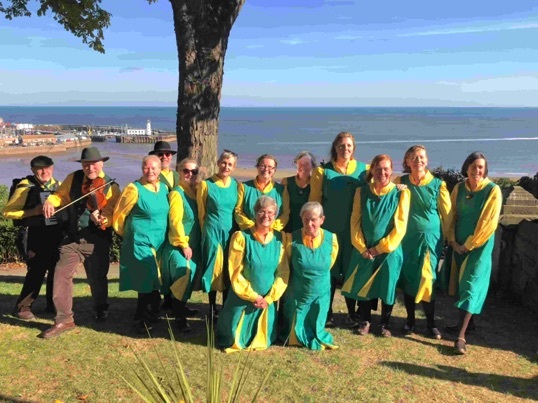 We also perform a number of recently composed dances in a similar style to those from the North West including one from Sheperdstown in West Virginia, USA. On Thursday evening in the summer we can be found dancing around pubs in South Yorkshire.